competition and they found it without a doubt. 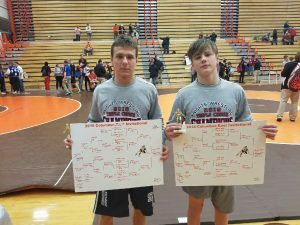 Columbus East won the invitational having 7 champs out of the 14 weight classes. The other teams helping make up the solid brackets in each weight class included Terre Haute, Edgewood and Homestead to name a few. The Knights kept their spirits high as they stepped on the mat going for the gold. SD ended up 4th place in an 8 team tournament and they are very proud of their placing with such high competition. The South Dearborn Junior Varsity Wrestlers traveled to Winchester, In for some wrestling on Saturday. They had a great day of wrestling and gained a lot of experience. They ended the day with several placers.